In August of 2010, Johnson & Johnson’s DePuy Orthopaedics issued a full United States recall of two of their leading hip replacement product lines: the DePuy ASRTM XL Acetabular System and the DePuy ASRTM Hip Resurfacing System. 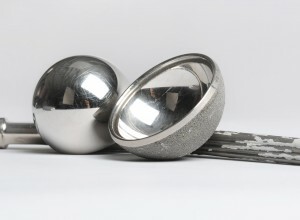 The metal bearings used in these systems are the basis of the problems many people have encountered with defective DePuy hip replacement parts. The metal bearings wear out quickly, creating metal on metal friction that leads to a release of metal fragments in the body. These fragments cause intense pain and damage the surrounding tissue. Failing metal joint components have also lead to an unnatural fusion of the implant with the surrounding tissue. The presence of metal inside a person’s body can also present serious medical risks. Patients experiencing problems with defective DePuy hip replacement parts have experienced intense pain and limited mobility, and generally had to have additional surgery to remove the defective implants from their bodies.How long did DePuy Orthopaedics know about problems before recalling their ASR Hip Replacement Systems? Beginning in 2007, DePuy received reports from the Australian Joint Registry identifying problems with DePuy ASR systems. The DePuy implant was recalled from the Australian market in December 2009. It was not until, over six months later, in August of 2010, that DePuy issued a U.S. recall of the implant. Patients undergo hip replacement surgery with hopes that it will improve their mobility and lesson their pain. DePuy’s failure to take immediate action put hip replacement patients at risk for serious damage leading to worsened mobility and requiring further painful surgeries. DePuy’s recall happened only after data showed that the ASR hip replacements were failing in over 12%, or 1 out of 8, patients within the first 5 years. Since the DePuy ASRTM XL Acetabular System and the DePuy ASRTM Hip Resurfacing System were released in 2003, as many as 93,000 of these units have been used in surgeries for patients. For more information about the DePuy products that have been recalled, or the problems that people are experiencing who have had a defective hip replacement device implanted, please call our office. If you believe you or a loved one have received a defective DePuy ASR hip replacement device, at Parilman and Associates, we would be happy to answer your questions and discuss your legal options. This entry was posted in Blog and tagged DePuy Hip Replacement, DePuy Hip Replacement lawyers, DePuy Hip Replacement Recall. Bookmark the permalink.